Read about - Burdekin Cascades Caravan Park below. 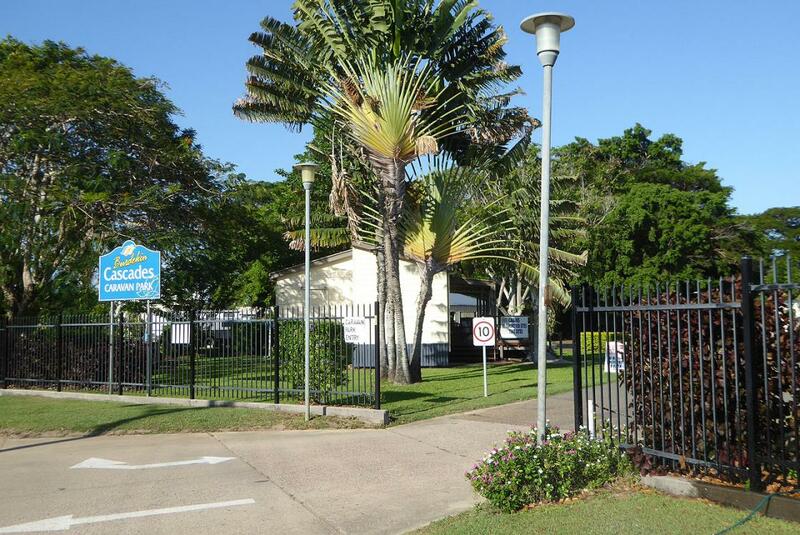 Burdekin Cascade Caravan Park is a council owned park in the middle of downtown Ayr, Queensland - in the Burdekin district. We were driving along the main street of town when we were drawn by the gardens and well maintained grassed areas near the entrance to the park. We called in for a look around and were warmly greeted by Sandy who was relieving the managers for a short while. We booked for one night and ended up staying four. The Burdekin Cascades Caravan Park has plenty of large trees that provide shade and maintain an abundance of bird life. We had a family of finches nesting in the tree above our site - just beautiful watching the parents feed their babies who were just learning to fly. The amenities are ensuite style unsiex bathrooms with toilet, shower and hand basin.-very clean. This is a relatively quiet park within walking distance to shops, restaurants, cafes, pubs and the Visitor Information Centre. We found this park very relaxing and friendly. You can recognise this park as you drive along the main street with the water features cascading over the rock wall leading to the entrance. This is a well maintained park with a dump point located near the reception area, sealed roads and easy access to sites. Cabins along the pool side of the park have shaded carports and are air conditioned to cope with the heat in northern Queensland. In fact those staying at the park and given free access to the public pool. We would not hesitate to stay at the Burdekin Cascades Caravan Park during our next visit to Ayr and will recommend it to all our friends travelling in Norther Queensland. have you been to Burdekin Cascades Caravan Park? Explore Burdekin Cascades Caravan Park - Ayr with RvTrips and find out where to stay, what to do and what to see. Helping caravan, motorhome and camper owners have a great holiday.